I hate waste. It’s poor economy and irresponsible consumerism!!! You can read my tips for reducing kitchen waste here. Now I’ve got that off my chest, there are many solutions for using up over ripe bananas other than discarding them. Firstly, there’s no panic. Bananas that get too soft to enjoy straight from the skin can be frozen, for up to 3 months. Bananas straight from the freezer can be turned into ice cream in just 30 seconds or used in a fruit smoothie. Thawed frozen bananas can be used in muffins, puddings and cakes just as you would fresh banana. I have had many favourite banana cake recipes in my cooking life, here’s my recurrent number one. Baked in a large loaf tin, this cake cuts cleanly, keeps fresh and moist in an airtight container and is so delicious it requires no adornment other than a sprinkle of icing sugar. Mash the bananas using a fork, whisk in the yoghurt, eggs, vanilla and lemon zest. Cream the butter and sugar until light and fluffy. Sift the flour with the soda and cream of tartar. Stir half the flour into the batter, the banana mixture then the remaining flour. Beat well to ensure the ingredients are thoroughly combined. Tip the mixture into the prepared tin. Bake for 40-50 minutes, or until a skewer inserted into the centre of the cake comes out cleanly. Rest the hot cake for 5 minutes in the tin before tipping onto a wire rack to cool. Lunchbox Banana Bread keep for 5 days in an airtight container. PS, I like your new logo. Very cute. Mmm yum! Are you still making your own yoghurt? Yes I am, with great success. The tub in the photo is a prop! 😃 I tried rice milk yoghurt, it was a flop! It is a happy day indeed when you must use an expensive Jalna tub as a prop and not a staple on your grocery list. Ah, rice milk. Oh well, nothing ventured nothing gained! 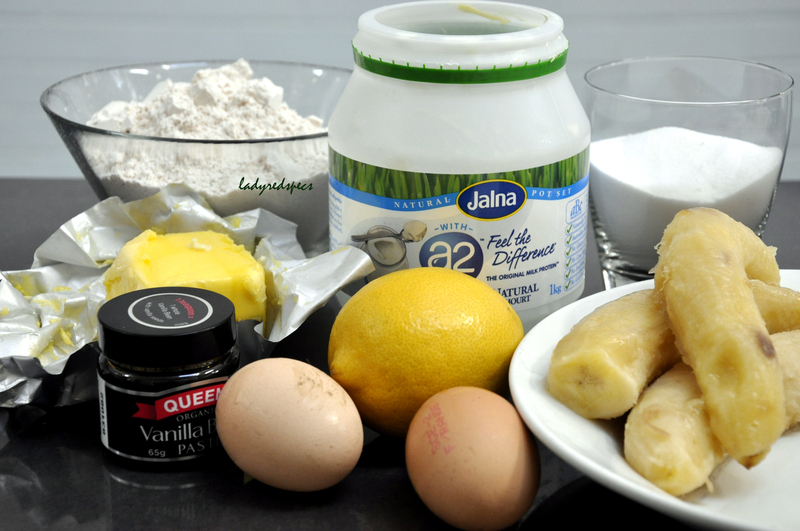 This entry was posted on February 28, 2013 by ladyredspecs in Baking, Cakes, FODMAP diet, Food and tagged Baking, banana, cake, FODMAP friendly, sweet bread, vegetarian.